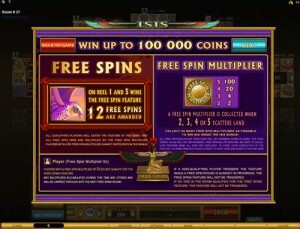 Isis Multi-Player is another version of Isis, another slot machine from Microgaming. The theme in both of them is inspired by the Ancient Egypt goddess called Isis, a much respected figure in the Egyptian religion. The present game is different mostly because of the social and multiplayer aspect that it introduces. The game is different enough feature wise, and it adds some new symbols as well, so it’s a different experience than you would get from the original Isis slot. The number of lines goes up to 40, the reels being 5 at all times. The game’s features include its multiplayer aspect, along with the free spins which are shared, though the multipliers are not. There are stacked wilds as well, and they are responsible for the top payouts of the slot. 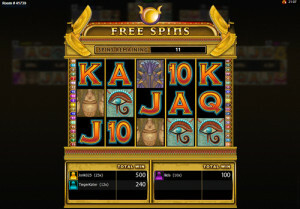 The multiplayer aspect would be the main thing that makes this slot different, but there are also stacked wilds inside, along with the scatter symbols, with free spins and multipliers. The social aspect isn’t that well covered in modern slot machines, but there are a couple of titles that do that, offering players the chance to play together with others. They can chat among themselves, make friends and take advantage of the free spins together, when one of them gets the feature to activate. However, each player accumulates multipliers on their own, so the end result can be quite different when the free spins do start. One of the important features of the game is the stacked wild, though the slot only allows it to appear stacked on the 2nd and the 4th reels. On the other three reels this symbol is a regular wild. It’s an unusual combination, having the same symbol both in regular and stacked versions, but it works and it’s better than having only normal ones. The wild substitutes for regular symbols, so the two scatters are excluded, and it can create its own combination of symbols. The free spins actually has two components. First of all, to trigger the free spins you need the Eagle symbol to be present on both the first and the last reel of the game, in the same round. You are awarded 12 free spins by it, and you use the multipliers that you accumulated along the way, before the free spins were started. You don’t have to be the one to trigger the free spins. Since it’s a social game, you can also benefit from the free spins that the other players are getting, though each one will have its own multiplier that they’ve accumulated. Getting the free spin multiplier to go up is done in the base game, with the help of a gold coin that will appear as a scatter. Getting 2 to 5 scattered Coins on the reels will offer you a prize (2x to 100x the bet), plus an increased multiplier for the upcoming free spins. The game uses up to 200 coins per round, but they’re of very low value, going only from $0.01 to $0.05. The maximum line bet becomes $0.25, while all 40 lines can be activated at the top value by using $10. 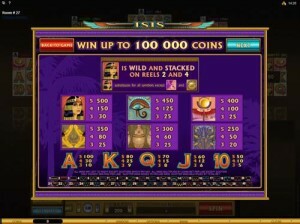 As for the big prizes offered in this version of Isis, the wild symbol offers 500x the line bet, or up to $125. The scatter symbol does better, giving you 100x the bet, or up to $1,000. The design hasn’t changed that much from the regular Isis game, but there are some new symbols being used, especially when it comes to the ones with features attached. The screen also makes room for multiple sets of reels, so you can see the slots of the other players as well, along with the chat room and their usernames. 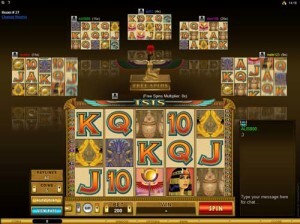 The design is still average for an Egyptian slot, but its multiplayer aspect should be enough to set it apart. Symbols: Isis (wild, 500x), Eagle (scatter), Gold Coin (100x bet, scatter), Eye of Horus (450x), Scepter (400x), Sarcophagus (350x), Canopic Jar (300x), Flower (250x), Ace (100x), King (80x), Queen (70x), Jack (60x) and 10 (50x). The multiplayer aspect brings a bit more excitement to a slot machine, which matters when you’ve tried them all and you’re starting to get bored. The social aspect is important for some people, and the game takes advantage of that. The features aren’t bad either, and I love that you can get free spins whenever one of the other player activates them, not just when you have the right symbols. 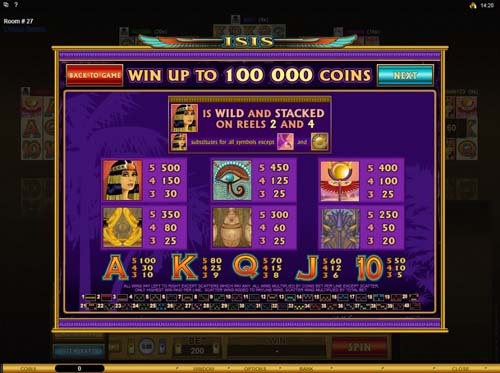 The Isis Multi-Player slot machine is offered through the Microgaming platform, so if you want to play it for real or just to practice, look out for casinos that use it.